The Redragon K552 KUMARA isn’t your average gaming keyboard. Not only is it over-engineered and built to take a beating, it is loaded with features including heavy duty metal and ABS construction, double-shot injection molded keycaps, high-end switches with mechanical ultra-last springs, crisp and bright adjustable RGB LED backlighting, a gold plated USB connector, and a splash-resistant design. * 6 colorful RGB backlighting effects. Choose from lighting options, including; rotating color sequence, random color rotation, lighting running from left to right, custom user defined lighting, lighting puddle effect, and more. * 87 double-shot injection molded keycaps are (RGB) LED backlit for razor sharp lighting that doesn’t scratch off. 100% anti-ghosting and conflict-free keys. * Windows key lockout option. GAMING KEYBOARD – BLACK VERSION; 87 Key Mechanical Gaming Keyboard with Custom Mechanical Switches (Cherry Blue equivalent) designed for longevity with greater durability and responsiveness The Mechanical Keyboard Keys offer medium resistance, audible click sound, and crisp, precise tactile feedback for ultimate Gaming performance. 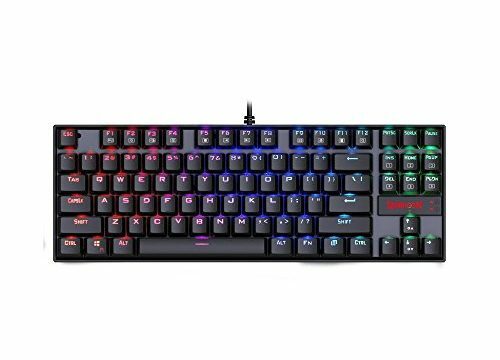 RGB MECHANICAL KEYBOARD; K552 Redragon RGB Backlit Mechanical Gaming Keyboard, the RGB Led keyboard comes with Double-shot injection molded keycaps offering crystal clear uniform backlighting and lettering that doesn’t scratch off. Featuring rainbow, RGB colors, 5different lighting modes, 5 backlight brightness levels, breathing speed,user programmable RGB backlighting. METAL – ABS CONSTRUCTION; The PC Gaming keyboard is constructed of metal alloy and ABS with plate-mounted mechanical keys and switches that stand up to tough gaming conditions. The Compact 87 key Space-saving Mechanical Keyboard Design, frees up workspace on your desk without sacrificing performance and comfort during your marathon gaming sessions.